Bigg Boss 10: Oops! Vikrant Singh Rajpoot Made A Blunder While Proposing Monalisa! Nobody predicted that Monalisa will marry her longtime boyfriend Vikrant Singh Rajpoot in Bigg Boss 10 house. Bigg Boss has taken the responsibility of Mona and Vikrant’s marriage that will unite two souls for the rest of their lives. As earlier, we reveal, Monalisa gets surprised seeing Vikrant in the activity area of the house. Vikrant, who was waiting for her, hugs Monalisa immediately and tells her that he is here to marry her. Vikrant then goes down on his knees with a sparkling ring to propose Monalisa for marriage and she immediately says “YES”. 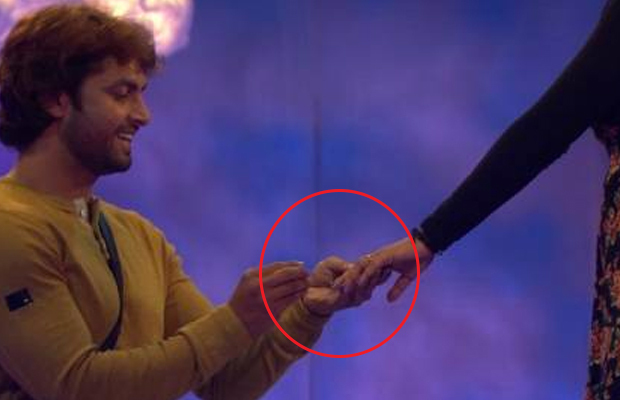 But did you notice in which finger did Vikrant put the promise ring? As years of traditions and belief, an engagement ring should be worn on the ring finger but Mona wore on the middle finger. Why? Whether you are engaged or not, almost everyone knows one thing that when it comes to engagement rings, it is worn on the ring finger i.e. on the fourth finger of the left hand. Vikrant and Mona are not aware of this? Or are they following some other traditions? They might answer this well!